The Indian Society of Plant Genetic Resources (ISPGR) and Bioversity International, in collaboration with the Indian Council of Agricultural Research (ICAR), Protection of Plant Varieties and Farmers’ Right Authority (PPV&FRA) (Ministry of Agriculture and Farmers’ Welfare), National Biodiversity Authority (Ministry of Environment, Forest and Climate Change), Trust for Advancement of Agricultural Science (TAAS), National Academy of Agricultural Sciences (NAAS) and Global Crop Diversity Trust (GCDT), is organizing the 1st International Agrobiodiversity Congress to take place on 6-9 November 2016 in New Delhi, India. The objective of the Congress is to provide a platform to all the stakeholders engaged in genetic resource conservation and management to deliberate on thematic issues of global importance, with major emphasis on rational and effective use of agrobiodiversity for food, nutrition and environmental security. 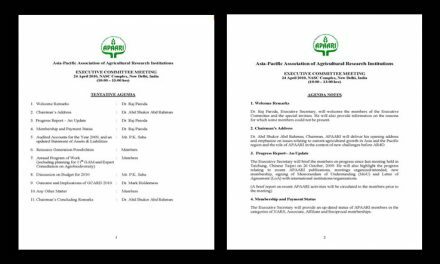 The organizers are pleased to invite scientists, students, farmers, as well as representatives from government, non-government organizations and industry to share their research experiences for sustainable management and utilization of agrobiodiversity. The IAC 2016 will offer opportunities to learn from keynote speeches, thematic scientific papers and poster presentations. An extensive technical programme will cover diverse themes around agrobiodiversity and will offer technical discussions on all aspects of agrobiodiversity management and utilization. More information and online registration can be found here: www.iac2016.in.